Bad behavior is routinely accepted — to a degree. Rudeness, bullying, and intimidation — to the point of an armed showdown with authorities — is where many draw the line of civility while others argue that this type of uncivil “disobedience” has become a necessity. Are actions without regard to how they affect others really what the People must now do to lobby for change? Currently, the armed occupation of the Malheur National Wildlife Refuge appears to be almost over. But, this type of fighting over hotly contested political issues will more than likely go on like it has in the past — politically motivated but without party affiliation. It’s happening routinely around the world! In Barker’s article, he went on to elaborate on the fact that congress and the executive branch are the ones making and executing the laws while federal employees are the ones on the front lines taking the heat when heated disputes arise over public policies. What creates “the heat”? Friction. 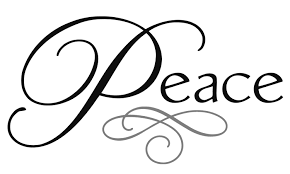 When we have two opposing views and the sides are unwilling or unable to make an honest attempt to listen to, clearly see, and do their very best to understand the opposing point of view, compromise becomes impossible. Frustration results. Absolutism rubs people the wrong way… creating friction. Eventually, frustration results in bad behavior. That said, there is no excusing disobedience that crosses the line to terrorism. But there is good reason for all of us to try to comprehend why we continue to see acts of violence perpetuated by frustrated individuals. We need to look more closely for the root cause of the frustration in this country over public policies. “I think that in changing their administrative processes as often as they do, the inhabitants of the United States compromise the future of republican government. He also predicted that we would move rapidly into despotism — ruled by absolutism. Have we arrived at that point in time? Political revolution, by definition, is a fundamental change in a political organization. In the 1800’s, Americans frequently changed the laws? Now? I don’t think so. I think the laws are being changed on us, not by us. In the 1800’s, the foundation of the Constitution was respected? Now? I think the foundation is being ignored, eroded, and misconstrued. But, this is the political season of seasons. There is no better time than now to ask our representatives and potential representatives to step up to the front lines and explain what they see as the foundation of our country. My personal views on federal lands, the Constitution, and the tactics it takes to be heard are in opposition to the armed occupiers of Malheur National Wildlife Refuge, but, I would also hope something good could still come out of this disastrous, misguided attempt at “civil” disobedience. The people of Burns should be heard. 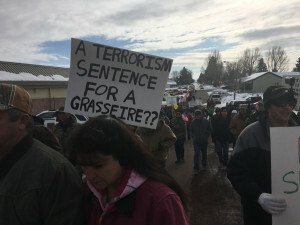 The Malheur occupation has broken down that spirit of cooperation, said Vanessa Leathers-King, 33, whose great-great grandfather was the first in her family to ranch in the county. She divided the community into three groups: Bundy allies, federal government allies, and a lot of people who identify a bit with both — like her. 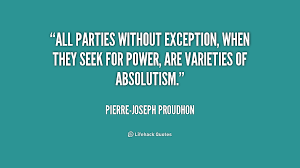 We’ve all heard the old saying that “absolute power corrupts absolutely” but we don’t seem to be able to recognize the destructive nature of absolutism itself — in each of us. In the case of this armed occupation, one dead so far. One community divided. The total damage? Unknown. The chance for something good to come out of this—up to us.